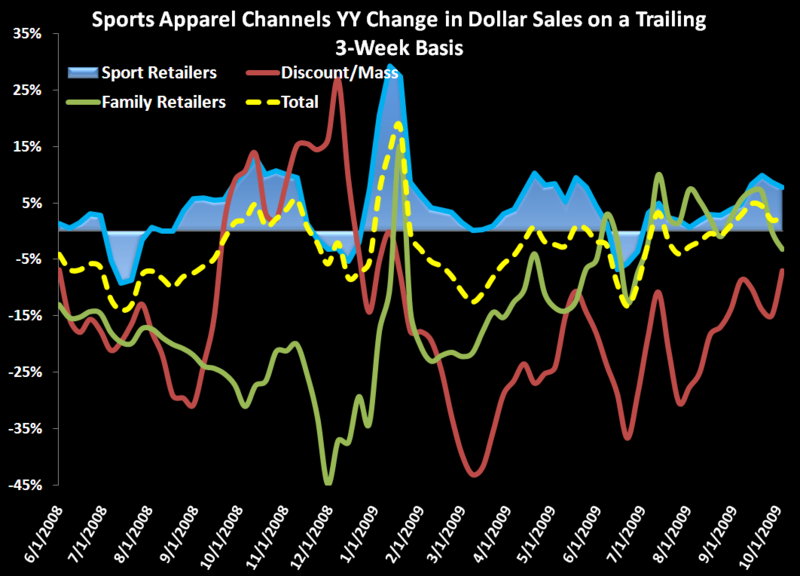 Total sports apparel sales made a large sequential improvement to up 7% Y/Y vs. last week’s reading of down 0.5% Y/Y. 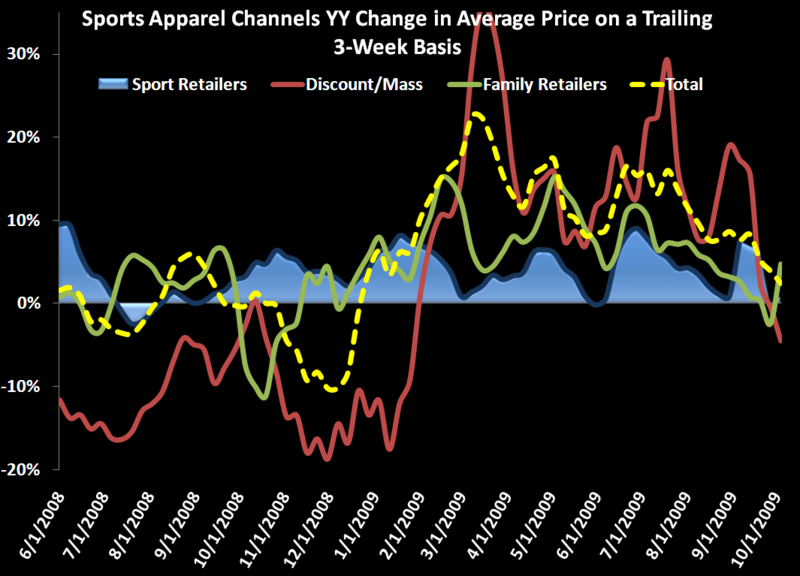 Total sports apparel units had three consecutive weeks of sequential improvements and finally posted a Y/Y growth reading – up 4% - aided by a large sequential improvement in the Discount/Mass Retailers channel – from down 5% Y/Y last week to up 14% Y/Y. A large sequential improvement in ASP for the Family Retailers Channel – from down 5% Y/Y last week to up 30% Y/Y – helped to boost overall industry ASP by 300bps sequentially. Outdoor Outerwear sales posted a large sequential improvement – from down 16% Y/Y last week to up 11% Y/Y. 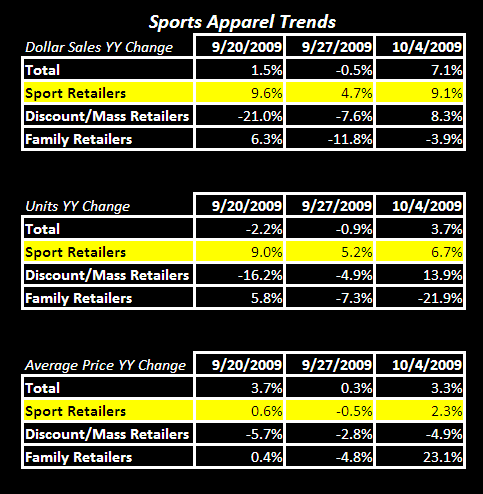 Compression Apparel sales also posted a sizable sequential improvement – from down 3% Y/Y last week to up 9% Y/Y. 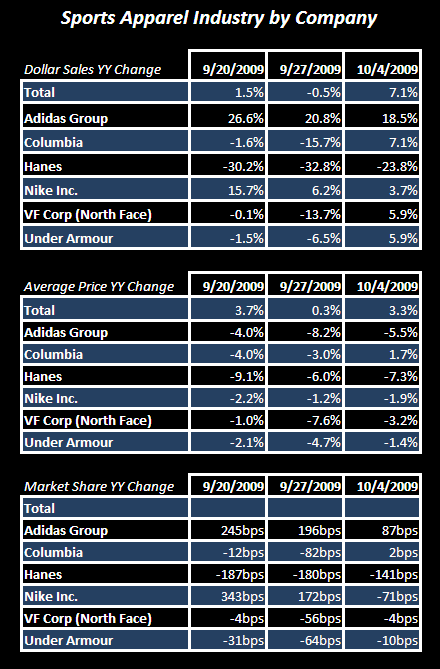 For the first time in 18 weeks, Nike posted a Y/Y decline in market share, down 71bps from up 172bps last week. After two consecutive weeks of Y/Y dollar sales losses, Columbia (up 7%), VF Corp (up 6%), and Under Armour (up 6%) all posted Y/Y dollar sales gains. Columbia is the only company in our sample to register a Y/Y increase in ASP this week, up 2%. For the first time in three weeks, Columbia also registered a Y/Y increase in market share, though rather minimal, up only 2bps. New England was the only region in the U.S. to register a Y/Y dollar sales decline this week – down 7%.